Cardigans and flannel blanket for my niece born June 7. Don’t miss the contest results and the new giveaway at the end of the episode! Download the episode (41:58) here. Here are the direct feed and the iTunes page for the podcast. I am Kittystitches on Ravelry and the podcast also has a Ravelry group and forum. – Flannel blanket for my niece who was born on June 7th! – Hot off the sewing machine: “robe de retour de noces” for my future sister-in-law, for the day after her and my brother’s wedding. 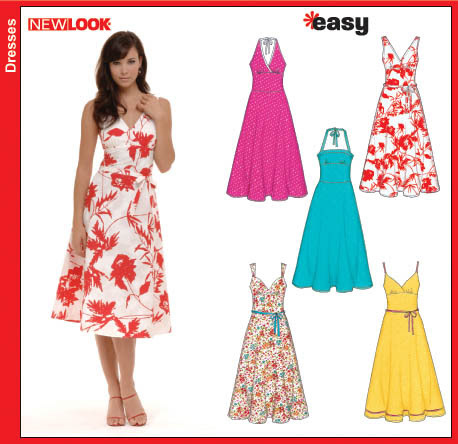 Pattern: New Look 6557. Out of a cotton fabric with a light taupe background and cream dots. – Dress for me to attend my brother’s wedding. I’m thinking Simplicity 2580, with the cowl neckline, in a vibrant purple. Fabric is from Minerva Crafts (the fabric I got it this one) after reading about them on Melissa’s blog. I’ve been knitting almost exclusively for babies for the past year or so! My finishes can be found on my ravelry project page (browse by “recently completed”). – Kimono à côtes plates (above) out of Lang merino 120 for my niece. Can be found in the English book by La Droguerie, La Droguerie’s Babies. – Brassière à empiècement arrondi (below) out of Passard Bout d’Chou (which I confused for some Drops yarn on the podcast). – Baby blanket for my niece, out of De Rerum Natura Gilliatt. – I proclaim my participation to the Summer of Lace and Beads after listening about it on The Knitmore Girls podcast. I am currently knitting Georgiana by Susanna IC, from the Jane Austen Knits 2011 issue (by Interweave). Out of Isager Strik Alpaca in a dusty mauve. I want to make more lace shawls! Feel free to suggest some designs. A year after being inspired by Katia’s crocheted shawl, I finally whipped up my own Half Granny Square shawl in Lang Mille Colori Socks and Lace (colourway #53). No pictures yet. Home decor items in cotton for our new home! Sponsored by MariaDenmark, who translates and sells Onion (and Minikrea) patterns. 2. Minikrea patterns for baby boys or girls: Baggy Pants 10300, Romper 10401, Overalls 10450, Snowsuit 10550. 3. Minikrea patterns for kids : Tunic 20200, Baggy Pants 20300, Empire Dress 30000, Hoodie 30500. 4. Local and organic goodies (chocolate made in Montpellier, organic tea). Gabrielle, your details weren’t included in your comment – please contact me with your details so I can send out your package. Thank you! Elizabeth Doherty, who owns the BlueBee Studio Ravelry store, has kindly offered to give out 3 patterns, so there will be 3 winners. Just leave a comment to this post letting me know the design you like best and would like to win in her collection. This giveaway concerns her self-published designs only, meaning those directly available through her Blue Bee Studio store. Contest will run until July 31st (Paris time). Your Podcast is wonderful and I have emailed the link to a few friends in my knitting group. I am just learning to knit but I find inspiration in your blog to keep practicing and raising my knowledge base. Welcome back, it wonderful to her your voice again, I'm happy that you are better. If I'm lucky I'd like the Bumble tam, I love it. Good to see your lovely projects and above all to see beautiful little choupie. Glad to know that health wise you are feeling good too. Life is good yeah! My favourite pattern would be the Ebbtide shawl. I like the Millrace shawl. Glad you're feeling much better. So nice to hear you again! I think my favorite pattern is the Millrace shawl! Simply beautiful and looks relaxing to knit! Oh, I am so happy to hear you again. Congratulations to you sister on the birth of her own daughter. Between your own little girl and the offspring of your siblings, your needles will always be busy! Of the Blue Bee patterns, I am particularly drawn to the Alewives Hat. I can promise I will enjoy knitting this if I get the chance to win the pattern. Have a wonderful rest of the summer and keep in good health! Welcome back! My favorite is the Millrace shawl. I haven't tried listening to these podcasts yet but will try this one – thank you. I love the Meris cardigan but all the patterns are lovely! Welcome back – how lovely to hear from you again! My favourite patterns is the Bumble hat. It is so refreshing to hear your voice again! You have such a lovely hand at finishing your projects. They look as if they were purchased in the store! I went through and I am really liking that sock pattern. What a wonderful thing to listen to on my walk to work this morning in the bright sunshine! It's so good to hear your voice again, and I'm glad you were able to find the perfect jersey at Minerva. 🙂 Congrats on the new flat, too, and good luck for the move! Fingers crossed Petit Mingon doesn't try to go back to her old “home”! It is so wonderful to hear your voice again. When the intro was playing I was positively beaming as it was like reuniting with an old friend. 🙂 I'm sorry to hear you have been unwell but happy that you have recovered. I look forward to hearing more about your future knitting, sewing and crotcheting adventures! Hello 🙂 I've just discovered your lovely podcast, I hope you're able to keep podcasting! My favourite pattern is the Coleridge, although I love several of them! Lovely projects like someone else said before me. I already have Bumble and the Norden Cowl in my Ravelry library so I would like to win the Colderidge wrap if I win.